The UNIDOOR PLUS shower door from DreamLine is perfectly designed to accommodate today's trends. It has a classic frameless design with three hardware finish options helping it enhance any bathroom style on any budget. With equal appeal and versatility as the original UNIDOOR, the UNIDOOR PLUS shower door adds an extra splash of class with an anodized aluminum U-channel. The UNIDOOR PLUS shower door combines premium 3/8-in thick ANSI certified tempered glass with a sleek frameless design for the look of custom glass at an unparalleled value. 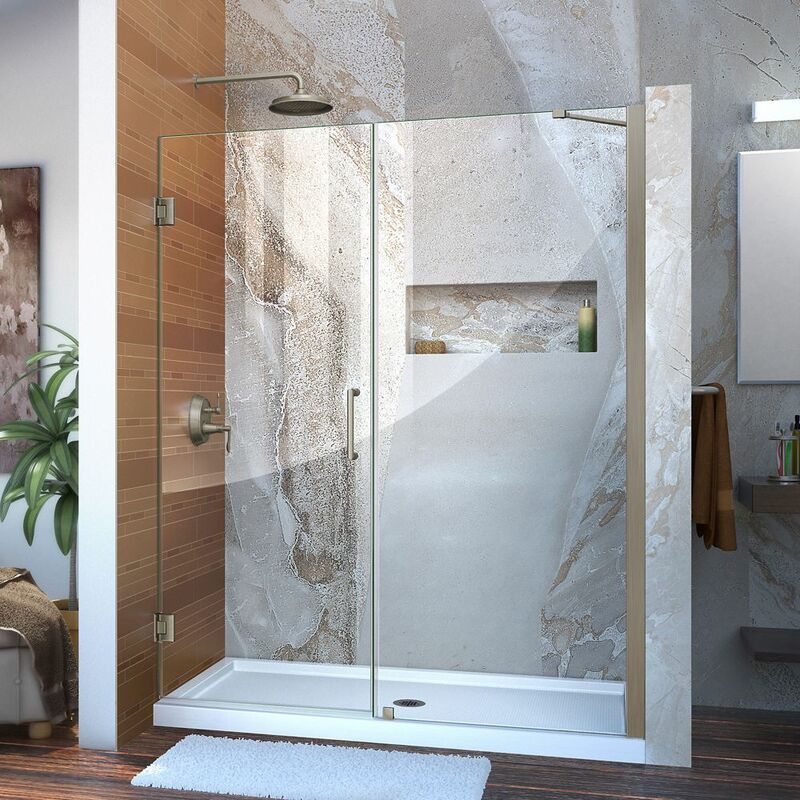 With clean lines, modern accents, an upscale look and a choice of clear or frosted band privacy glass, the UNIDOOR PLUS shower door adds a touch of timeless style to any bathroom space. Note: To minimize leakage, install shower head opposite of door opening aimed at tiled walls, fixed shower panel or floor. NOTE: DreamLine shower bases will always be larger approximately 2-in than the corresponding DreamLine shower enclosures/doors. Renovate your bathroom with sophistication and style. Bring in light and open space all the while accentuating your ceramic decor with the MAAX Reveal door. Its frameless 8mm glass with unique and robust patented hinges and matching towel bar is a must have for your bathroom renovation project. Unidoor 58 to 59-inch x 72-inch Frameless Hinged Pivot Shower Door in Brushed Nickel with Handle is rated 4.7 out of 5 by 19. Rated 3 out of 5 by Elaine from Love the door but did not like handle. The handle... Love the door but did not like handle. The handle was so cheaply made. This is our 4th door we have bought from this company. The other 3 had heavy duty handles. Rated 4 out of 5 by Helen from It's pretty and clean. My kids love it. The only thing is that the handle on the door is only on... It's pretty and clean. My kids love it. The only thing is that the handle on the door is only on one side. Wish both sides has handles. Rated 5 out of 5 by RHinSunriseFL from Has been installed now for three weeks and so... Has been installed now for three weeks and so far so good. Rated 5 out of 5 by Lynn from What a beautiful addition to our remodeled bathroom. Quality construction including beautiful, t... What a beautiful addition to our remodeled bathroom. Quality construction including beautiful, thick glass. It does take the right tools to install, as mentioned by other reviewers. Make sure you have the correct drill bits and lots of water for drilling. It takes some patience and time for installation, but well worth it.